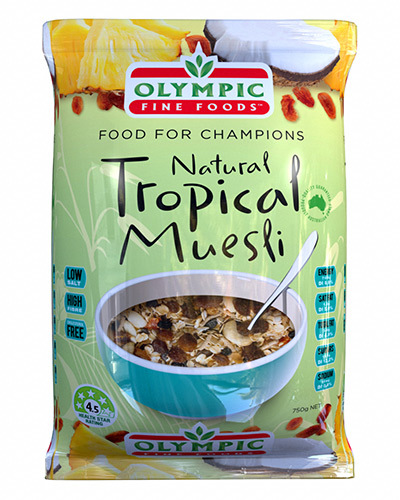 Olympic Tropical Muesli is a selection of wholesome grains, nuts, seeds and fine quality dried fruits, mixed with premium 100% Australian Rolled Oats, producing a delicious and nutritious tasting breakfast cereal. With an array of Tropical Fruits including Pineapple and Papaya, this Muesli makes for a light and fresh start to your day. Delicious served with hot or cold milk, flavoured or natural yoghurt, fresh or stewed fruit and a topping of your favourite ice cream. Love our Natural Tropical Muesli product?